One question that I keep getting when I do someone's hair is, "why don't you blow dry my hair instead of using a flat iron?" Flat irons were invented for straightening curly, frizzy hair unlike blow dryers. Blow dryers were invented for drying hair in half he time it would normal take. It doesn't mean that blow dryers can't straighten hair. But I prefer using a flat iron to do that. It's like what my math teacher used to say, "there is a variety of ways to do a math problem but there is always one answer." 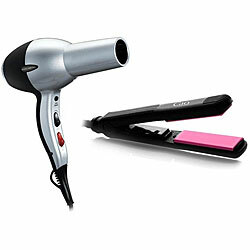 There is a variety of ways to straighten hair but at the end you will get straight hair. It's all up to you and the way you feel comfortable doing your hair. There is never a "wrong" way to do it!